This case study is provided by the Sea Scout Group in Surrey, United Kingdom. We are a Scout Group based in Surrey, UK. potential, benefit from a positive, supportive environment and make a real difference. The activities we provide are run by a team of dedicated adult volunteers. The one thing that unites our leaders is the energy and enthusiasm they have for giving young people the adventure of Scouting. Many of our leaders have full time jobs and a family, we’re all busy! Over the past year, we’ve seen a 17.6% increase in boys and girls joining our activities – we now offer fun and adventure to more than 100 children in the Molesey community. Because of this, it’s important that we work together as a group to ensure that equipment and facilities can be shared effectively amongst our sections. In the past we’ve had occassions where equipment and use of our Scout HQ has been double booked, obviously not ideal! 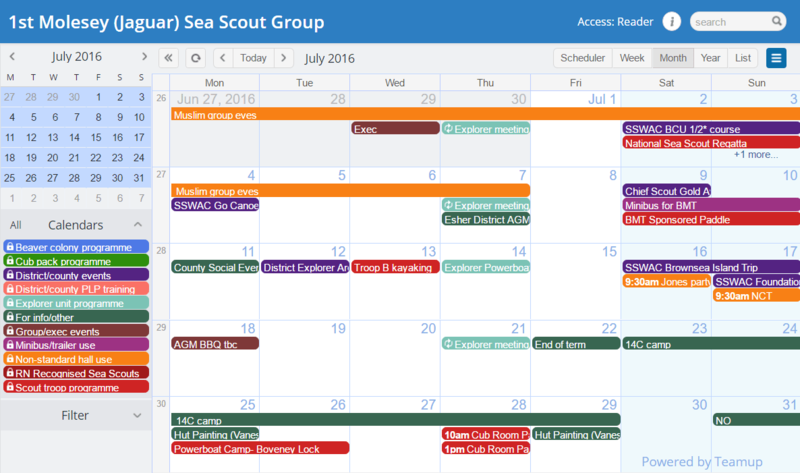 It was clear that the Scout Group needed to find an online calendar solution that could be used to help us plan effectively. We love Teamup Calendar. It’s a fantastic tool – easy to use and really flexible. It’s user interface is uncluttered and simple, allowing our volunteers to add events with ease. Teamup is an ever evolving tool and recently there’s been a few exciting new features added. The software works really well on a mobile device and it’s really easy to share events by email or social media. Since we started using Teamup we’ve found it much easier to plan events without conflict of equipment and facilities. Thanks Teamup!